And so it begins..or should I say continue? Taking down the Christmas decor, which is a lengthy task in our household. Here’s why. My Christmas season begins in October and ends sometime in January 🙂 Most bloggers will have their decor down by January 1, but it takes me longer and frankly…I’m in no rush. Our family enjoys the decor and the kids are sad to see Christmas end and the trees put away. Not to mention, my hubby doesn’t exactly enjoy disassembling five trees and trying to get them back into their boxes. If I could, I would leave the 12 foot tree decorated and roll it into a closet and bring it back out next season. Unfortunately I don’t have closets tall enough! You can check out all the trees I have decorated over the years at Christmas Tree Tour & Ideas. When it comes to taking Christmas down, I try to retain as much as possible for the remainder of the Winter season….without having to buy anything new. I’m sharing a few tips with you on how I manage to get through without spending a dime. Our sunroom is a magnificent place to hang out, it’s my favorite room and I really enjoy decorating it for Christmas. This room is where we spend Christmas morning and Christmas Eve with family, check out Sunroom Christmas Tour. I had decorated the room with 2 Christmas trees, one on either side of the fireplace and garland hanging from the mantle. When I removed the garland from our mantle, it appeared so bare. How I would miss the twinkling lights. I realized that I’m not quite ready to see them go. If you have been following along, you have heard me talk about moving things around…which I do constantly! I move chairs, tables, mirrors, and decor around from room to room to see what fits best into each space and to create different looks without spending any money. 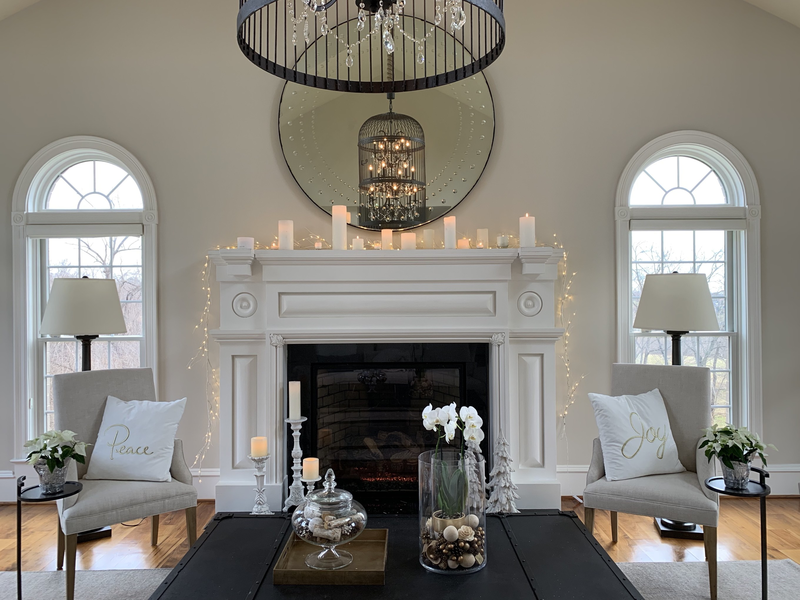 The lighted birch garland HERE on the mantle was used in Christmas Dining Room Home Tour 2018 and our kitchen for Our Christmas Home Tour & Annual Holiday Party 2018. The white lights and ambiance it brings to each room is magical, it has created 3 different settings each having a different feel. In this room, I brought in candles and lined the top of the mantle. Did you know, the top piece of stone on the mantle is granite which I painted? Check out Is It Possible to Paint a Granite Surface? I also brought the chairs from our formal dining room into the space and used pillows I had in the kitchen, check out Our Christmas Kitchen Home Tour. The coffee table was also brought in from another room, I like it better in this room, haven’t decided yet if it will move back. My chunky throw is a staple in the sunroom all year long, you can find a similar one HERE, HERE and HERE. My sweet friend gave me a white orchid over the holidays. I normally have the delicate blooms in my living room, but moved it to the sunroom for a fresh change. Instead of buying new flowers for this space, I am using the poinsettias that were on our kitchen table and by bringing them into this room, it gives the plants a new look. When I set up our Christmas trees in this room, I moved the sofa from the side of the room to the center. I really like the sofa facing the fireplace, I am leaning towards keeping this configuration for a while, easy enough to move the sofa back with furniture slides HERE, I can even do it myself and our sofa is VERY heavy! The room gets a lot of natural light and is very bright, even in the Winter months. I often get asked about my chandelier and accent tables. The chandelier is no longer available but a similar one can be found HERE. The accent tables HERE are awesome, I own 4 of them and use them everyday, again using them in different rooms and playing around with different spaces. Similar style mirrors can be found HERE, HERE, and HERE. Moving some of the coffee table decor to the space behind the sofa and adding a serving tray gives the room a new look. Another item I move from room to room depending on need is a tray table HERE, perfect for entertaining. I was able to transition my Christmas decor and create a Winter look for my room by retaining some of the elements I used for the holiday. Candles, Poinsettias, pillows, twinkling lights and an elegant orchid give me a fresh start to the New Year! How about you, is your Christmas decor down and packed away? For more posts about home decor, subscribe to Happy Haute Home and follow along on Pinterest HERE, and Twitter HERE and feel free to pin and tweet your favorite pics from Happy Haute Home. Next Post How to Host an EPIC House Party! I leave my Christmas decorations up until the end of January, sometimes even Feb, if it is a snowy winter, but then they are more winter decor than Christmasy. I took most of the outside ones down but left the wreaths on the doors. That is a nice look with the white birch lights on the fireplace…..elegant but cozy. Oh good! Glad I’m not the only one. We haven’t had much snow at all, hopefully this weekend we will get a couple inches. Enjoy your decor! Hi Toya, happy new year! Not really, I think I would get sick of it and it wouldn’t feel special when Christmas came around, but maybe I’m wrong..and I would love it…hmmm have to think about that a little more. Hope you’re doing well! Haha–I totally understand. I don’t think I could do it either lol. I am doing great, thanks for asking. Happy New Year to you and yours and I can’t wait to read all of your blogs for 2019. I’ve left out a few “wintry” decor as well. Especially the twinkly lights on my fireplace mantel. And I take down my Christmas decorations within the first week of January. Just not specifically January 1st. Beautiful use of space in this gorgeous room! I love the elegant touches with lights and candles you added for winter. Pinning for inspiration! Thank you so much Michelle, appreciate the nice comments!